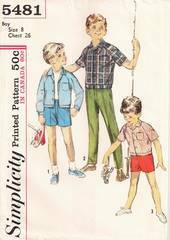 Original vintage Simplicity 5481 sewing pattern from 1964. Pants and shorts have fly front with zipper closing, casing across the with back with elastic and a back hip pocket. Raglan sleeved shirt-jacket has a band at lower edge, front button closing, patch pocket and notched collar. Long sleeves with buttoned cuffs or short sleeves. Top-stitching is optional. Boys' Size 8, Chest 26, Waist 23, Neck 12. Pattern is complete and has been meticulously cut and folded.